Note: This is taken from a time when I was going through a spell of severe spiritual dryness. 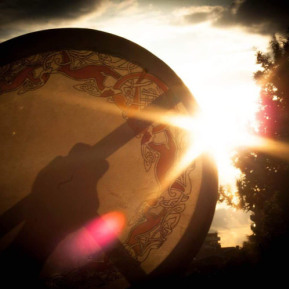 However, playing my bodhran drum for a studio recording helped me remember the Divine Order that is all around me, as exemplified by the rhythm of the drum beats. Preparing the parched ground for growth. Helping the wood to remember its roots. Now it will sing earth’s holistic hymn. And life is broken from its shell. A reflection of some deeper plain. The common elements are wed! Avellina Balestri (also known by her pen name, Rosaria Marie) is a Catholic Christian with a deep appreciation for Celtic culture and mysticism. She is a founding member and Editor-in-Chief of the online magazine The Fellowship of the King (www.thefellowshipoftheking.net), a place where spirituality and creativity meet (which, by the way, is open to submissions). In addition to reading and writing extensively on matters of history, spirituality, and culture, she is also a recording artist, singing traditional folk songs and her own compositions as well as playing the penny whistle and bodhran drum. In all her endeavors, she draws her inspiration from the Ultimate Love and Source of Creativity, and hopes to share that love and creativity with others.